Marco Mattiacci, are supporting INTERPOL's Turn Back Crime campaign. 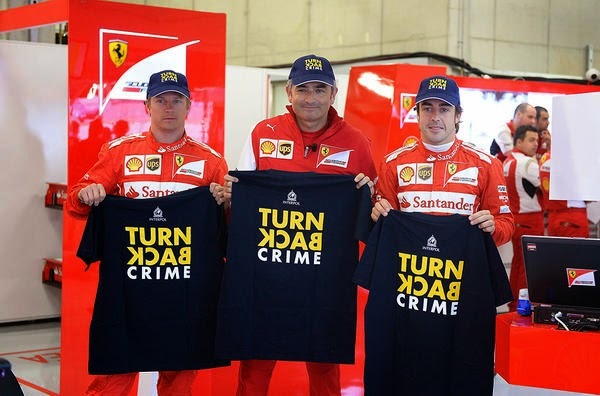 Lyon, France: Two of the world’s best known Formula 1 racing drivers – Fernando Alonso and Kimi Raikkonen – are adding their voices to the Turn Back Crime campaign. For example, buying fake goods, illicit medicines and counterfeit items isn’t about a cheaper option, it feeds organized crime and terrorism. INTERPOL’s Turn Back Crime campaign seeks to enlist the support of citizens and companies not ordinarily associated with fighting crime to demonstrate that each of us has an important role to play in making the world safer, and a contribution in developing worldwide a culture of legality. In reaching out across borders and cultures, and using new language to speaking about fighting crime INTERPOL hopes that people young and old will embrace this concept and will find new and innovative ways to communicate how we can Turn Back Crime together.